Sorry I made you wait. By now you may have read a few posts about Who Was There. This is my experience, in tiresome detail, of a very cool kidlit drink night. Arriving at Bar 9, I made my way to the back room, and met Betsy  or Fuse#8  right away. She was wearing her “I Am Kiki Strike” T-shirt as promised, and we exchanged our so-glad-to-meet-you-at-lasts. We chatted briefly and went up to the bar. I released her to host her party, and ordered a chicken sandwich. Hey  I said tiresome detail, and I meant it, people. Ordering at the bar at the same time was the only other person I had planned to meet at the drink night. Tim Bush, illustrator and gentleman, had offered me practical assistance for my visit to the Big City, and had agreed to make sure I made it home safely to my friend’s apartment. But we hadn’t met in person either. Well, he was very nice and fun to talk to. We talked for a while at the front of the bar instead of returning to the party already in progress. After fortifying myself with a chicken sandwich, one beer consumed, one beer in my hand, and some good conversation, I was ready to mingle. When I walked into the back room, I realized that everyone was already in little clusters of people that they knew. I did the best thing I could: scurried to the quietest, least populated corner of the room. Now, who would have guessed what a wise decision this would be. Because it seemed that I met many people in my quiet corner. People who were dropping off their coats on the couches. People who were using the well-lit area to reapply lipstick. People who needed elbow room for a few minutes. I quickly met all of the Longstockings. Actually, one was missing  as it is Longstocking policy to always have one member not in attendence in case the bar is attacked. Or maybe that’s Congress and the State of the Union Address. Anyway, I spoke with Lisa Graff, who gave me a copy of her book. Important, given that I will interview her on Saturday. I talked with Caroline Hickey, who will send her book shortly. 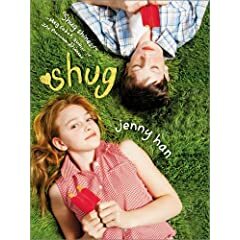 And I talked with Jenny Han, whose book, Shug, I read, loved, and praised. We talked for a while about her book and her thoughts in writing it. She’s working on something for younger readers now, and I made her pinky swear to get me a copy. In my quiet corner, I met Ron from Galleycat, and we talked about blogging for fun and profit. I met J.L. Bell from Oz and Ends, and we talked about blogging, writing in general, Newbery awards, and world peace. Though I may be wrong about the world peace one. He was a very interesting guy, very nice, and also quite attached to our corner. Alvina from the Blue Rose Girls (A picture of Alvina, J.L. and me is on her site) made it back our way, bringing along Barbara Johansen Newman, who deserves particular mention for being one person who was specifically looking to meet me during the evening. So bless you, BJN. (A picture of me and Alvina is on her site.) Then some class of 2k7er’s entered my territory, which meant business cards for everyone. Huzzah! Yi Shun Lai told us about her book featuring a man-eating cabbage called, I believe, Cole’s Law. Then, another kismet encounter in the quiet corner. A woman walked up holding a book  and this book was the one book in the whole Bloomsbury catalog that I was interested in reviewing. I told her as much, she gave me the book (or I wrestled it out of her hands), and sketched me in her notebook. We talked, along with J.L. Bell, about illustrations in middle-grade books. The author’s name is Ruth McNally Barshaw, and I’m sure I’ll be writing about her book, Ellie McDoodle: Have Pen, Will Travel, soon. Time for a bathroom break and another beer (only three so far  don’t judge me). On the way back to the room, I ran into Betsy. We talked a bit, and she introduced me to Laini Taylor. She and her husband have the most beautiful art on their business cards. She has written a novel that Betsy just raved about, and I hope I’ll get to see it myself someday. The back room had cleared out some now, and I just inserted myself in a conversation with two women. One was 2k7er Rebecca Stead, and we shared some kid stories and some laughs. One was Michelle Knudson, who’s the author of Library Lion, plus also the editor of the Junie B. Jones books. I LOVE Junie B. Jones. We talked about J.B.J. for a while, and I believe she said she would forward my J.B.J. article to Barbara Park. And I believe that was before I gave her my wallet. With the party winding down about 11:00 p.m., and the host leaving (we had made plans to talk the next day), I was ready to head out. Seeing my new friend Tim on the far side of the couch engaged in conversation, I climbed behind Barry Goldblatt (at the time it seemed less rude then walking in front of him, but in retrospect may have been more rude) and sat between him and Tim. And found myself sitting across from Linda Sue Park. Well, I wasn’t going home now. 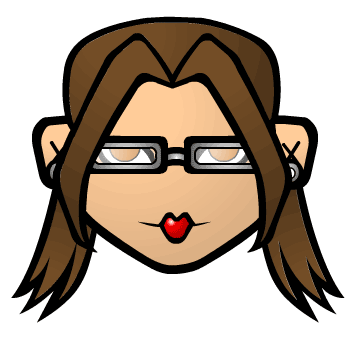 I was glad to meet her, and she reads my blog (yeah, baby! ), so of course I like her. She was very nice and very charming. She’s putting out a book of poetry soon, which we talked about, in between the times that Barry Goldblatt was telling her which 2006 books were total crap (apparently many popular YA titles). When she got up to leave, I did too. I was able to collect the promotion card from Tracie Zimmer for her new book Reaching for Sun. I mention her card because it was actually a packet of daisy seeds, which may be the cutest thing ever. In going to close out my tab, the wonderful Blue Rose Girl Alvina introduced me to David Diaz. Whom I did not know as a Caldecott-winning illustrator. But he did not seem the least bit offended by my ignorance, and was very charming. And a little hot, by the way. Okay, now I was ready to leave, and Tim and I had a real chatfest as he escorted me across town to the door of my friend’s apartment. It was closing in on 1:00 a.m. by the time I got home. I had two ARCs, a number of business cards, and (at least) one new friend. Not bad for one night. Not bad at all. Great story (but we're glad to have you back)! It was so nice to finally meet you! I'm glad you had a nice, full weekend. Okay, I refuse to edit again, but I realized that I also met and chatted briefly with Sarah Beth Durst, author of Into the Wild. I need to add this to the comments because she wrote a wonderful post on her blog describing her own experience at the SCBWI conference and kidlit drink night and she seems like a swell gal. It was so great to meet you, motherreader!! I'm glad I wandered into your corner. I'll let you know when your sketch is online. It was a genuine treat meeting such a wonderful smartass! And thanks for the mention of me.